A local television reporter interviews construction workers on the streets of New York. "It's a very touchy thing because they want to do this on sacred ground," said Dave Kaiser, 38, a blaster who is working to rebuild the World Trade Center site. "I wouldn't work there, especially after I found out about what the imam said about U.S. policy being responsible for 9/11," Kaiser said. The grass-roots movement is gaining momentum on the Internet. One construction worker created the "Hard Hat Pledge" on his blog and asked others to vow not to work on the project if it stays on Park Place. "Thousands of people are signing up from all over the country," said creator Andy Sullivan, a construction worker from Brooklyn. "People who sell glass, steel, lumber, insurance. They are all refusing to do work if they build there." "Hopefully, this will be a tool to get them to move it," he said. "I got a problem with this ostentatious building looming over Ground Zero." A planned 13-story community center and mosque two blocks from Ground Zero, Park51 has exploded into a national debate. 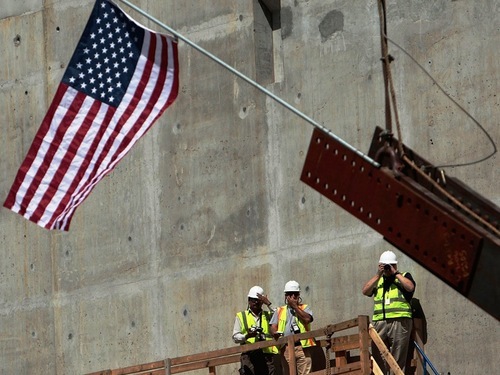 Louis Coletti, president of the Building Trades Employers' Association, said unions have not yet taken a "formal position" on Park51, but he understands why members would be hesitant to work there. "It's a very difficult dilemma for the contractors and the organized labor force because we are experiencing such high levels of unemployment," he said. "Yet at the same time, this is a very sacred sight to the union guys." "There were construction workers killed on 9/11 and many more who got horribly sick cleaning up Ground Zero," Coletti said. "It's very emotional." L.V. Spina, a Manhattan construction worker who created anti-mosque stickers that some workers are slapping on their hardhats, said he would "rather pick cans and bottles out of trash cans" than build the Islamic center near Ground Zero. "But if they moved it somewhere else, we would put up a prime building for these people," he said. "Hell, you could do it next to my house in Rockaway Beach, I would be fine with it. But I'm not fine with it where blood has been spilled." Spina, who sells 9/11 apparel on his website, said he's printed thousands of stickers and plans to produce thousands more. "They're going all over the country," he said. "They got pretty popular fast." Popularity aside, there are some construction workers choosing not to set themselves against the project. 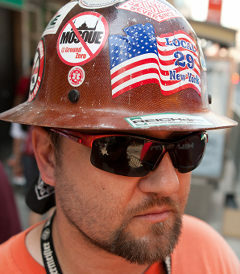 "Hundreds of guys here are wearing stickers as a sign of protest, but I'm on the fence about it," said Frank Langan, 50, a site superintendent from Queens working at Ground Zero. "It's a tough debate," he said. "I sympathize with workers' position, but at the same time, you can't single out all Muslims because of a small number of terrorists."